作者: The AsiaN Editor on 21 August , 2018. 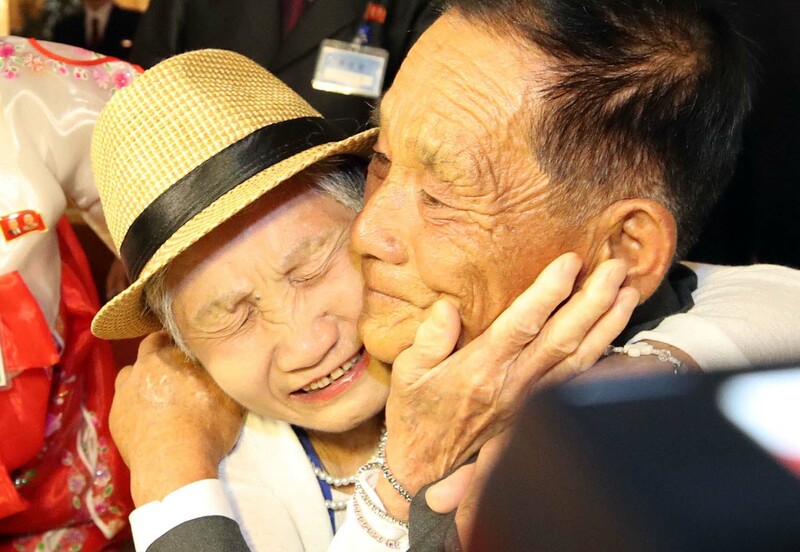 Relatives separated by the 1950-53 Korean War tearfully reunited at Mount Geumgang in North Korea, Monday, for the first time in 65 years. Participating from the South were 89 people who registered with the Korean Red Cross to find their relatives in the North, accompanied by family members. Kim Choon-sik, 80, embraced his two sisters as they wept in his arms. Kim fled his hometown of Ongjin County in South Hwanghae Province, and came to the South with his parents and his younger brother during the war, thinking the evacuation would be temporary. His younger sisters stayed with his grandparents in the North, thinking their family would return but they never did. “For the rest of their lives my parents never mentioned my sisters or their hometown after they came to the South. It was probably because it was too painful for them,” his younger brother Kim Choon-young told the press earlier Lee Ki-soon, 91, met with his long-lost son and his granddaughter. After asking the names of his son’s siblings, Lee smiled broadly and said, “This is indeed my son. This is my son.” Lee’s son was only two years old when they parted. Lee left his family in Ongjin County in the North and came to the South with his older brother. Among the participants were six reunions involving South Koreans who were abducted by the North during the Korean War. The oldest participant from the South was Baek Seong-kyu, 101, who met his daughter-in-law and granddaughter. Baek earlier said he brought 30 pairs of shoes and 20 sets of spoons and chopsticks for his long-lost relatives. “I got a lot of things because it will be my last visit,” Baek said. Other participants from the South brought gifts including clothes, medicine, cosmetics and snacks Participants began their three-day reunion with a group meeting, followed by a banquet hosted by the North. The meetings will continue Tuesday and Wednesday. They will be able to have lunch separately with their relatives, Tuesday, a new arrangement made to allow participants to spend more time with their long-lost loved ones. In a second reunion from Friday through Sunday, 83 North Koreans will meet with relatives from the South at the same venue. Holding reunions in August was one of the agreements in the Panmunjeom Declaration reached at the summit between President Moon Jae-in and North Korean leader Kim Jong-un, April 27. The last reunions were held in October 2015; and resuming them had been an urgent issue as most of the surviving people are elderly. According to government data, 85 percent of them are in their 70s or older. This is the 21st set of reunions since the first ones held in 2000, after leaders of the South and North met for the first time the same year. Over 130,000 South Koreans are registered as separated family members. The past 20 reunions enabled around 20,000 people to reunite with long-lost relatives, but this is only 15 percent of the total number registered.